Lenzie Academy are once again among the schools competing in this year’s SP Energy Networks Warriors Championship for schools. The latest edition of the event, launched at Whitelee Windfarm on the outskirts of Glasgow last week, will see more than 1,000 girls and boys given a platform to display their skills at Scotstoun Stadium, the home of Glasgow Warriors. 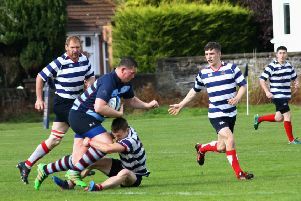 The tournament will involve 25 schools from across west, central and southern Scotland compete during seven weeks of action, with the final being played prior to the Guinness PRO14 match between Glasgow Warriors and Edinburgh Rugby on Saturday, April 27. 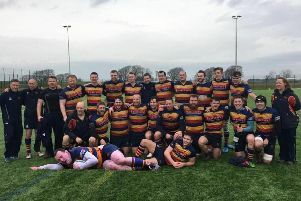 The Warriors Championship was established four years ago and has helped raise awareness of rugby union at grassroots level whilst promoting active and healthy lifestyles to young people. SP Energy Networks began supporting the event last year after coming on board as the club’s Official Community Partner at the beginning of the 2017/18 season. Pupils and teachers from participating schools were joined at Whitelee by Glasgow Warriors player Lee Jones, SP Energy Networks chief executive Frank Mitchell and Nathan Bombrys, managing director of Glasgow Warriors. Mr Mitchell said: “We’re delighted to be working with Glasgow Warriors again this year to promote the benefits of grassroots rugby in the communities we serve. “As well as getting young people active, the partnership is a fantastic way for us to engage young people with STEM subjects and inspire them to be a part of the future of the energy sector, where many of their qualities as budding sports players are equally as valuable. Nathan Bombrys added: “We’re proud of our partnership with SP Energy Networks, our Official Community Partner, and the Warriors Championship wouldn’t be possible without their generous support. “This initiative is part of our wide-ranging community programme, which includes camps, training sessions and pre-match community activity before all our home games. “The Warriors Championship has grown year-on-year and is an opportunity for kids to come and play rugby at the home of the Warriors, including some who wouldn’t normally get the chance to play competitive rugby. Each school will take part in qualifying rounds at Scotstoun, beginning on Wednesday, February 6, and will have S1 and S2 boys’ teams competing as well as an under-15s girls’ team. Lenzie’s qualifier will be on February 20 when their opponents will be, Maxwelltown High School, Falkirk High School, Cumnock Academy and Oban High School. Throughout the 2019 SP Energy Networks Warriors Championship, school kids will get an opportunity to meet members of the Glasgow Warriors squad.